What’s NRR and How Does it Work With Earplugs? Workplace noise is more than just annoying and disruptive – it can cause serious damage. In a perfect world (or work site), eliminating noise right from its source would be the ideal solution – but, this isn’t always a realistic solution. So, what can you do to protect your hearing while on the job? Establishing a hearing protection program is the first step. Identify the noises on your worksite: where are they coming from, how loud are they and how long are you and your workers exposed to them? Asking these questions will help you determine which hearing protection is the right fit for you. There are tons of options out there. This number which you see on the side of every ear plug packages is meant to explain how good that particular earplug is at blocking sound. Contrary to popular belief, this number is not designed to tell you how many decibels you personally will be protected. Rather, NRRs are determined from laboratory tests which give an estimate of how much noise a hearing protection device can potentially reduce. The higher the number, the more likely it can reduce noise levels – but that doesn’t necessarily mean it will. Just like any other personal protective equipment, you need to ensure that you are wearing the right fit. 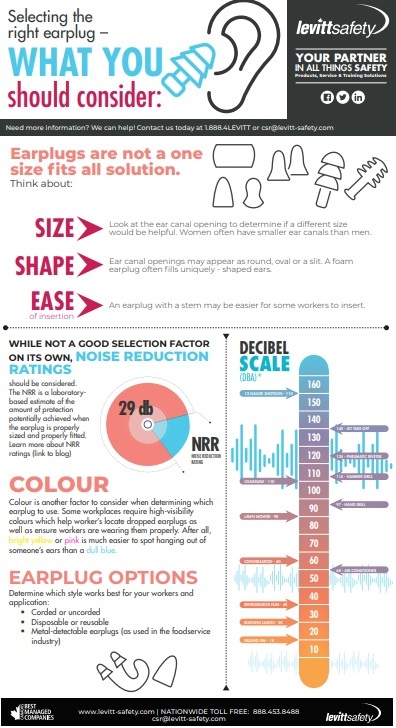 Factors such as the unique shape of your ear canal and whether or not you are properly wearing the hearing protection greatly affects the potential noise reduction rating far more than the materials of the earplug itself. You may also notice a suffix of L added to the class which is shown as Class AL or Class A(L) on the packaging. This means that the hearing protector is designed for reducing noise at low frequencies (125 Hz) of at least a 20dB. This added protection is generally at the same price-point which makes it a worthwhile upgrade to preserve your hearing across all frequencies. Here’s the tricky part. Just because your ear plug states a NRR of 30 dB on the package, it doesn’t mean you are getting 30dB of noise reduction! CSA Standard Z94.2-14 specifically states that these NRRs are not indicative of the laboratory tests and therefore it is important to de-rate the NRR to get a real-world estimate of the actual noise reduction you are receiving. How you de-rate your hearing protection depends on the type of hearing protection you are using. The rule of thumb is to assume that the actual efficiency of earplugs is 50 per cent of the listed NRR. Feeling overwhelmed? Don’t be! There’s a lot that goes into determining the right earplug for you and your job, but the good news is that we’re here for you each step of the way. 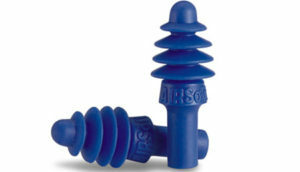 To learn more about your options when it comes to earplugs, along with some of my top picks be sure to take a look at our new earplug page.